Simple to install, operate and maintain, The SecureALL Guardian System is comprised of five components including hardware and software seamlessly working together. The SecureALL server is installed at the client site behind their firewall and serves as “Mission Control” for the security system. Our fully integrated software and hardware makes it easy for clients to customize system settings to meet their needs. Example of customizable settings include activation distance or U-Key™ parameters, and alert notifications. SecureALL wireless routers are used to communicate between the server and locks. Pairing is automatic. No manual set up is required. Unlike other systems that require expensive access control panels which need to be programmed individually, our routers transmit all system settings from the server wirelessly over-the-air to locks. SecureALL routers are powered by the client’s local area network and all communication is protected by the strongest encryption technology available in the market. Every door lock on a campus is controlled wirelessly. The system administrator defines who has access to what room, at what time and this information is transmitted by routers to wireless locks at each door. After access control information from the server is received, the door operates independently and is capable of making all decisions. Communication with the server is not required, as it is with many other systems. If the network is down or the power goes out, the SecureALL locks are not impacted. To minimize installation costs, locks do not require any power, sensor, or data lines. A U-Key™ is a small electronic key assigned to each user. The U in U-Key™ stands for “universal” because a user only needs one key to open up all locks authorized to them on one or more campuses. No more need for cumbersome key rings with dozens of keys to track. The U-Key™ operates totally hands-free. It does not need to be presented and line-of-sight is not required to open doors. The U-Key™ contains microprocessors and uniquely encrypted IDs, which can be programmed for any individual’s personal needs. For example, an individual with a disability may have their U-Key™ set to open doors at greater distances. In addition to the U-Key™, users have the option of proximity and smartcard readers, bluetooth low energy (BLE) phone access, 10-key push button, and back up metal keys. As an optional feature, trackers can be placed at different locations in the facility to enable the location of valuable assets and personnel. The system can quickly detect if an individual or asset with a U-KeyTM is not in the building or on the campus. This is extremely helpful in emergency situations where it is necessary to account for all personnel quickly. Individuals carry a U-Key™, uniquely programmed with their access and security settings, which enable hands-free entrance, creating an open but secure campus. Once the Access Control List is downloaded from the server to the door lock, the lock is capable of making all entry decisions autonomously. Battery-operated locks continue to function in the event of a power outage or network problem. SecureALL’s routers are uniquely plug-and-play and pair automatically with all nearby wireless locks. No manual effort is required. The SecureALL Server contains custom system settings and houses a database of all user information. Special routers with multi-directional antennas track the location of assets containing embedded U-KeysTM, and send notification if an item goes beyond defined boundaries. Patented Extreme Low Power (ELP) radio frequency (RF) communication technology delivers the only system that does not shut down periodically to conserve battery usage. Delivers the equivalent of wired communication but with wireless installation savings. ELP yields 4 – 6 year average battery life vs typically one year for other systems. Remote shuts down an entire campus in less than 10 seconds through a central server. Local secures a single room with the push of an inside button vs other systems that require opening the door to lock it. We also alert campus safety automatically. Intelligent (reflex) automatically puts a campus in lockdown when three close rooms are put into local lockdown. Locks are easily programmable so that a single U-Key™ can open doors at different distances. For example, an office door may be accessed at 2 feet, a front door at 10 feet, or a garage gate at 100 feet. Exact distances can be modified depending on user need. 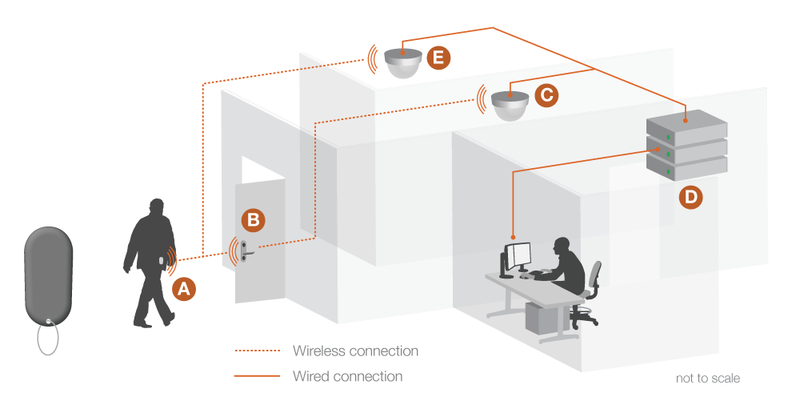 System provides notification if an asset with an embedded U-KeyTM moves beyond a predefined space in a building. U-KeyTM tracking can pinpoint the location of all individuals so first responders can quickly bring them to safety. All SecureALL locks come with integrated door ajar sensors (no wiring required). These sensors let facilities know if a door is being propped open when it should be closed or if a door is still open at the end of the day. SecureALL’s fully integrated hardware and software enables the most advanced, multi-level encryption in the market. Far more secure than a system knitted together using pieces from disparate providers.